I have taken my engine apart, reassembled it, and lived to tell the tale. Not only that, but I’m left with a nicely running car that I can finally drive again. I’ll get into the details shortly but I have to say I’m feeling pretty proud of myself at the moment. I feel knowledgeable and capable, and I’m looking forward to the next car project. Here’s how it all happened. In the fall, I bought a car to help facilitate my separation. 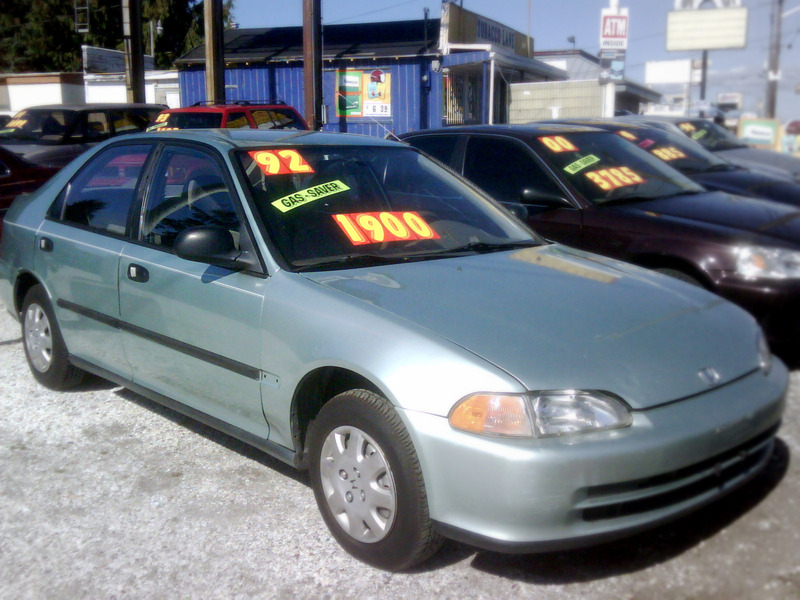 After a morning of intensive shopping (up and down Aurora Avenue), I found a 1992 Honda Civic 4-door that was a good deal. I paid $1700 for it (plus fees). I had a good feeling about the car, and it served me well for a few months. Then, on Christmas Day, trouble began. By the next day, white smoke poured out of the exhaust pipe and the car idled really roughly. It was obviously serious. 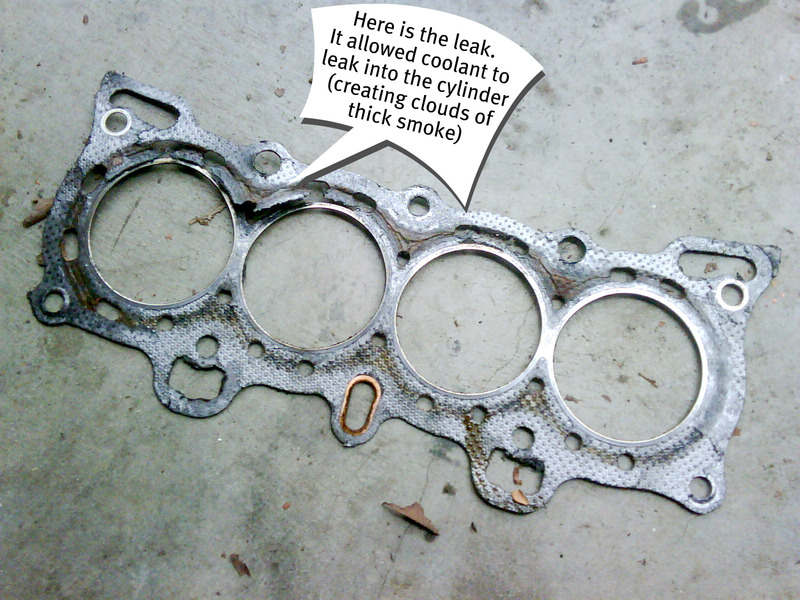 I took it to a mechanic, and got the dreaded diagnosis: broken head gasket. The repair cost for this (and associated work) would be about $1700, what I paid for the car! I retrieved my car from the mechanic with a “no, thanks.” Luckily, Tim has a second car he’s not using, and kindly allowed me to borrow it for the time being. This gave me time to consider my options. Grant suggested that replacing the engine entirely would be cheaper and simpler than getting into the head to replace the gasket and resurface the head. And, this would be a procedure he’d be comfortable doing himself! Having always wanted to learn more about engines (and knowing next to nothing at this point), I jumped at the chance to take on this project. 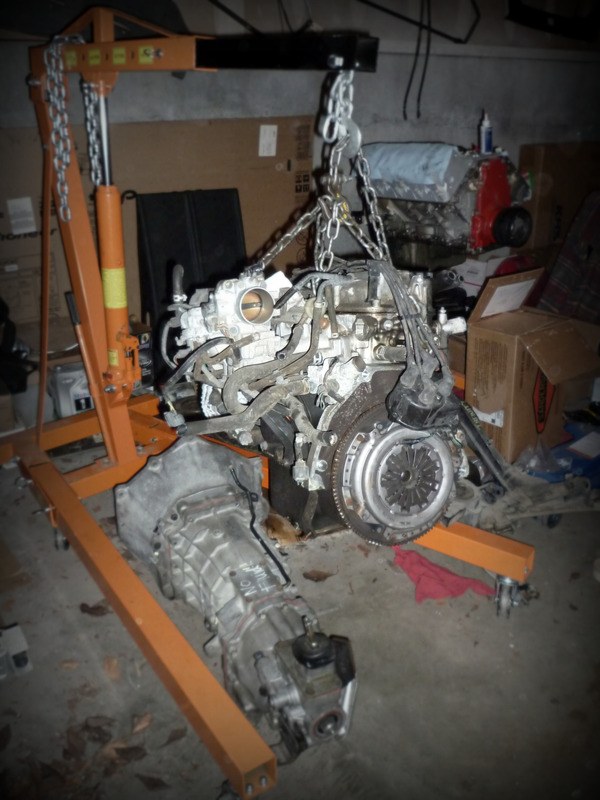 We found a used engine on Craigslist with low mileage for the year, and a good price (because it was missing a distributor – something I already had). It was delivered this week and I worked with the delivery guy to get it up on the hoist. All is in place for a weekend of greasy work.